As expected, BEA’s second stab at GDP growth for the second quarter was even less inspiring than the first. Headline growth was a tepid 1.6%, down from the 2.4% previously reported. Consumer spending and business spending on equipment and software were actually stronger than earlier estimates, but business structures, inventories, and exports all weakened, while imports (which deduct from GDP the way BEA calculates it) grew faster than previously expected. Investment showed particular strength. Business investment in equipment and software (E&S) grew at a 25% pace, thus adding about 1.5 percentage points to overall GDP growth. Boosted by the end (hopefully permanent) of the new homebuyer tax credit, housing investment grew at a bubble-like 27% pace (adding about 0.6 percentage points to GDP). Despite solid growth in disposable incomes–up 4.4% adjusted for inflation–consumer spending grew at only a 2.0% pace. As a result, the saving rate increased to 6.1%, compared with 5.5% in the first quarter. And then there are imports. As I’ve discussed before, BEA calculates GDP by adding up all the components of demand for U.S. products–consumers, businesses, governments, and export markets–and then subtracting the portion of that demand that is supplied by imports. That means that any growth in imports appears as though it subtracts from overall economic growth. That happened in a big way in the second quarter. Imports grew at a brisk 32% pace, thus subtracting (using BEA’s accounting approach) 4.5 percentage points from overall growth. Which is why all those blue bars in the graph net out to only 1.6% GDP growth. I should also note that BEA’s calculation of contributions to GDP growth, which I graphed above, is subject to the same criticism that I’ve leveled at the claim that consumer spending is 70% of the economy. In a perfect world, an appropriate share of the imports (the red bar) would be netted against each of the components of demand (the blue bars). 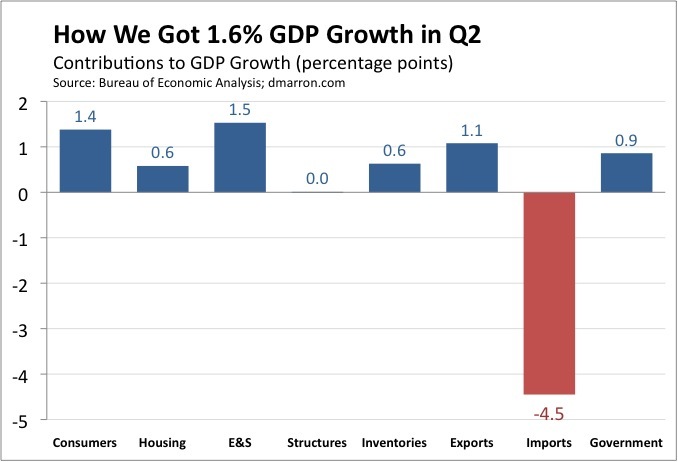 The result would be a graph of contributions that would truly illustrate how much each category of demand actually contributed to U.S. GDP growth. I hope to take a crack at that in the future (but I said that last month, too).